The US Department of Transportation's recent policy guidance for self-driving cars was interesting for what it did not contain. While the government told car manufacturers what they need to do to make their vehicles safe, it kept a narrow focus. There were no guidelines for drivers or road-builders. That's not unreasonable, considering that the most advanced semi-autonomous cars are still a miniscule minority of vehicles on the roads – and even the most optimistic projections see them remaining a minority for many years to come. Should money be spent altering roads just to suit a small minority? What if those changes actually made roads less safe for human road users? Autonomous vehicle makers, however, are already pressing for road improvements, and some governments are beginning to respond. Car makers say that one of the simplest things that US authorities could do is to follow their own standards and mark roads properly. Last year, Los Angeles Mayor Eric Garcetti announced bold plans to capitalise on the autonomous vehicle market by ensuring the city’s roads are ready for it. “We will ensure that the demands and challenges of this new technology are fully considered as we invest in our infrastructure and plan for L.A.’s transportation future,” he said. However, when the mayor later sat behind the wheel of a self-driving Volvo during a press demonstration, the car repeatedly refused to move. That was because its cameras could not clearly see the faded paint of some road markings, according to Volvo North America President, Lex Kerssemakers, who was sitting beside Garcetti. "It can't find the lane markings. You need to paint the bloody roads here," Kerssemakers complained. He wasn’t the first automaker to complain about the state of the roads, and wouldn’t be the last. “We really need better lane markings. This is crazy,” Tesla CEO, Elon Musk, told reporters, as he showed them a section of the 405 Freeway near Los Angeles International Airport that is marred by two overlapping sets of lane markings. His company’s autonomous vehicles could veer out of their lanes because their cameras tracked the wrong set of lines, he complained. Tesla could only make the road safe for its own cars by mapping each lane out in advance so the cars no longer have to rely solely on sensors. Musk, who commutes to work along the same road, has funded a group pushing for improvements. A related bugbear for autonomous car makers is the inconsistency of lane markings and signage. In the US, traffic signal formats and sign designs can change as you cross state boundaries. As well as calls for standardised signs and markings, there are moves towards more high tech solutions. “For autonomous vehicles to work well, roads, road signs and signals may need to be mapped or made intelligent,” commented Singapore government researchers in a recent report. This call for smarter roads ties in with proposed standards, such as dedicated short-range communications (DSRC) and automotive LTE, that enable vehicles to communicate with each other (sometimes referred to as V2V technology) and to communicate with the road infrastructure – also known as V2I, for Vehicle to Infrastructure. V2V systems are broadly analogous to the traffic collision avoidance system (TCAS) used by aircraft, warning drivers of impending collisions. The US National Highway Traffic Safety Administration has been pushing for mandatory transponder-based V2V systems for more than a decade, and appears close to getting political approval. While they were originally envisaged as an aid for human drivers, V2V and V2I offer a variety of significant benefits for autonomous vehicles, not only augmenting sensor data, but perhaps letting cars share sensor data to get a wider, clearer view of the road. Moreover, researchers at China’s Baidu point out other uses for these technologies. Autonomous cars can’t understand hand signals from a road construction worker or a traffic police officer. Currently, the car’s human driver would obviously have to take control. 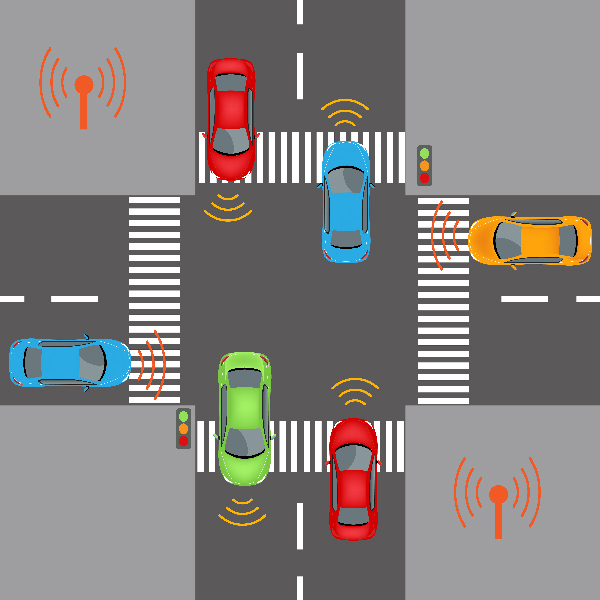 But the researchers suggest various solutions for fully-autonomous cars, such as giving the workers wireless beacons that direct autonomous traffic – these beacons could use the V2I networks that are under development. Emergency vehicles will also need a reliable way to make their presence known to autonomous vehicles, perhaps via V2V technologies. If the move to redesign roads to suit self-driving cars is followed to its logical conclusion, then there’s an intriguing, but potentially unwelcome, outcome: new roads which take advantage of autonomous vehicle features, but may actually be less safe or less suitable for human drivers. Or even, eventually, roads where human drivers are banned. The 360° sensory awareness and faster reaction time of autonomous vehicles could allow roads to be narrower, making them cheaper to construct and freeing up space in cities. Perhaps less parking space would be required, particularly in congested areas like city centres. V2V technologies could allow cars to travel much closer together and faster, and with the addition of V2I, autonomous vehicles would not require traffic lights or other street signs – as long as they were not sharing roads with human drivers or pedestrians. Finally, to return the question of whether it's right to alter our roads just to make things easier for autonomous vehicles. Perhaps that question will never be answered. Maybe such changes will gradually take place without deliberate government intervention. Let's imagine a potential near-future scenario, perhaps a decade from now, when ten percent of vehicles on the road are using advanced autonomous driving features. Imagine that local transport authorities notice that at a particular intersection, a high proportion of accidents involve autonomous vehicles. They determine that this is because the vehicles are failing to see a traffic signal in bright sunlight. So they move the traffic signal, or add additional signals, and the accident rate falls. Effectively, they've just redesigned the road to suit the needs of non-human drivers. But what about the rest of us? Blog written by Mark Patrick, Mouser Electronics. Are the roads safer with self-driving cars?